4.0 out of 5 starsGreat Reading. This a story of an honourable hero and a heroine who is used to being a useful member of her community. This is a sweet book but very much "fluff"! Everything happens exactly as you know it will after the first chapter. I found the author's attempt to reinforce that the Earl was raised in Scotland and spent years at sea to be grating... so many "lassies" and "laddies" and sailing metaphors that I kept rolling my eyes. So, all in all, ok - a quick holiday read with little substance , but that's exactly what you expect with these types of books. I would have given it 3.5 stars if we could give 1/2 stars. 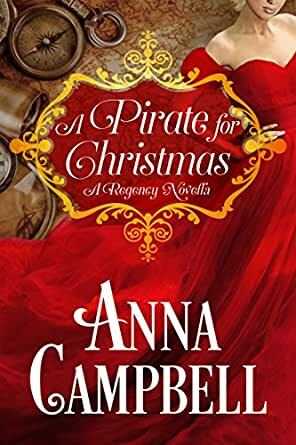 As has become her tradition, Anna Campbell has written a memorable and sentimental Christmas novella in A Pirate for Christmas. Full of mistletoe and mayhem this was just the kind of read to rein in the holidays. What's not to love about witty repartee, well meaning, meddling villagers and a cupid playing donkey. Endearing and charming the hero and heroine of this work are the kind of characters you cannot help liking. Love at first sight and snowflake kisses clinch the deal on this wonderful Christmas romance. I wouldn't mind spending my mornings with a heartwarming story like this one. A dashing pirate and a sensible yet gorgeous young woman caught in a winter wonderland. Anne Campbell tells an engaging story! It was a delight to read, A Pirate for Christmas, written by Anna Campbell. Every times, this author writes a Regency tale, she always surprises me, and I think she has outdone herself this time! I could not put it down, found it so sweet and fun to read. It had every elements to please me, a Christmas tradition, mistletoe, a charming couple getting caught in a blizzard on Christmas Eve, tenderness and passion to last a life time! I couldn't ask for anything more, this beautiful tale really pleased me! I loved her two main characters, Bess, the vicar's daughter, a bold and headstrong woman and Rory, a Scottish charmer, ex pirate and a devilish man. Both made quite a pair! Their charming relationship started with a one kiss, then another kiss here and there...They were meant for each other. I loved this phrase the heroine said “Now I've got him at my mercy, wild horses couldn't drag me away”. The teasing between Bess and Rory is simply so cute! Another Christmas magic in the air! If, you want to get into a Christmas mood, then it’s perfect for you! A Pirate for Christmas is absolutely lovely, warm-hearted, and delightful Christmas tale that will get you in a festive mood, when a book makes me feel that way, the author has done her job very well!